Welcome to this sacred space. I’m Transformation Goddess, Shann Vander Leek. Do you want to become a woman who releases blocks, is fully expressed, self-confident, and ready to embrace this sacred life? If your answer is yes, I’m here to support you. I’ve reinvented myself over the last twelve years from my long-time role as a corporate TV advertising sales director to the soulful, creative, and sovereign woman before you today. I can support you to focus your full attention on the exploration of your soulful, sensual and sacred feminine life. As a teacher, mentor, and transformational coach, I have the experience, education & resources to help you free your voice, reclaim your feminine sovereignty and transform your sacred life. My soul’s purpose is to witness, listen, and engage with women like you who want to walk in beauty, with full awareness of your personal power, divinity, and joyful essence. I facilitate the Transformation Goddess Experience A 90-day private goddess coaching program which includes powerful self-inquiry exercises, creative expression, guided meditations, and compassionate self-care. I dreamed up the Sacred Heart Teachings digital program for women who want to heal their past, let go of limiting beliefs, and begin to liberate their hearts with gentle Yoga postures, relaxing guided meditations, and supportive journaling exercises. This Sacred Life Podcast is a platform where you can choose to share how you’ve learned to walk in beauty with tens of thousands of women around the world by reserving our popular Divine Feminine Spotlight sponsorship. I created another path to help women amplify their voices and flaunt their sacred truth with the creation of Podcast Bath Media Services. Podcast Bath is for female coaches, authors, healers, and entrepreneurs who want to strategize, produce and launch new podcasts, online classes, audiobooks, and radio shows but don’t feel comfortable stepping forward on their own with all of the technology involved in the process. I’ve been producing and co-producing two podcasts for over 8 years, with almost 4.6 million downloads. I can help you launch your new podcast in 30 days. 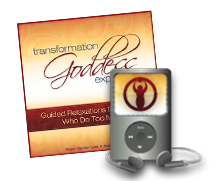 To get started right away on your transformational journey, you’ll want to claim my complimentary Transformation Goddess Album: Guided Relaxations for Women Who Do Too Much. It’s easy. Just add your name & email up above or down below and you’ll receive the album along with a gorgeous Transformation Goddess Manifesto poster for your goddess journey. You may wish to listen to an episode of the soulful This Sacred Life podcast, read our popular blog or claim a Sacred Discovery Session to begin your divine feminine transformation. Interested in creating a new podcast, radio show or audio class? Visit at PodcastBath for a free consultation. P.S. Read my glowing coaching reviews to get a feel for how I show up for my clients and what they take away from our partnership. If you feel like we’d be a good match, let’s talk!